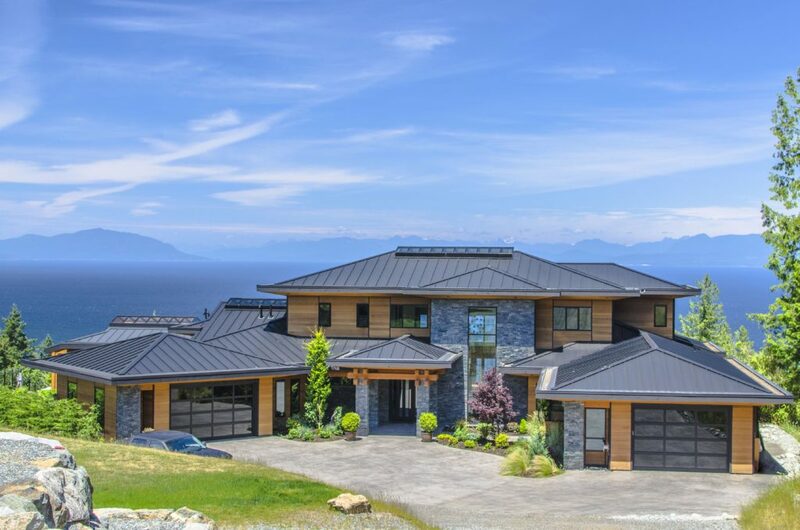 Breathtaking ocean views come standard with this modern west coast design, located in Nanaimo, BC. The entire home is wrapped with natural cedar plank siding, glass, metal roofing and Black Pearl Ledge Stone Veneer. The clear linear definition of materials provides a beautiful contrast which highlights the modern coastal architecture. Stone pillars have been incorporated into both the interior and exterior of the building which provides stability throughout the structure. Vaulted ceilings in the main living area provide a floor to ceiling fireplace overlooking the ocean with a two store wall of glass. The backyard features a spacious outdoor living area with an outdoor kitchen, living room, putting green, pool and hot tub. Stone posts continue their theme throughout the back patio as they incorporate glass railings to ensure they do not block the ocean view. The veins of the mountain produce striking white quartz lines which highlight K2’s Black Pearl Ledgestone. This profile effectively blends the popularity of a ledgestone style with the demand for color consistency. It is rich in texture, yet soft in appearance, which promotes a pleasing neutrality to exterior or interior applications. Ocean Pearl slate has a unique geology that can only be found on Vancouver Island. The Ocean Pearl capping is one solid piece of slate that has a cut top, bottom and sides. Additional finishing options include Flamed Sides, Sealing or Polishing.